Full ledger grave markers have been around for many decades, and have been utilized to cover the full length of the area where a lost loved one has been interred. These monuments can help create a beautiful and traditional appearance, and help ensure the person interred remain undisturbed for all eternity. It is interesting to note that full ledger grave markers of days past were often the actual lid of the stone coffin the individual was interred in. While many families did opt to have the information of the deceased inscribed in the lid, it is also not uncommon to find these larger markers of days past, completely blank. The reasons may vary as to why families often opted to not personalize the marker, or lid of the coffin, in this case, but as mentioned before, it is not uncommon. 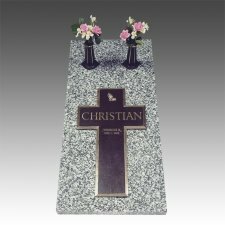 Full ledger grave markers today offer a traditional appearance, and with the advantage of modern technology, can be personalized to suit any taste or need. Many families are attracted to the full ledger memorials, for the attention and respect these monuments command. 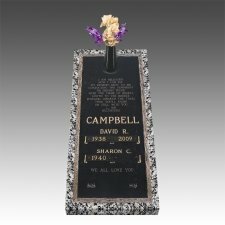 These beautiful markers can be personalized with basic information, such as the name and dates of an individual, but also offer additional room to add an inscription, emblems, or even ceramic or bronze portraits of the beloved, if desired. 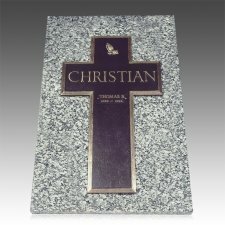 While many full ledger memorials are used to commemorate the grave of an individual, they can also be used for double-depth family plots, or plots where multiple sets of cremation ashes have been interred. The two main styles these larger, flush markers offer feature either a bronze plaque mounted on a granite base, as well as the option of a granite only memorial, which will accommodate the information directly sand blasted into the stone. For those opting for the bronze on granite style, all information is cast into the bronze for a long lasting and breathtaking tribute. Both styles can be enhanced with the addition of a complimenting, cast-bronze flower vase as well, which can recess into the memorial when it is not in use. For those considering the bronze, there are also a variety of traditional and modern bronze colors offered, which help further capture the personality of the lost loved one. The granite also features a number of exquisite colors to select from, and the range of colors available in this natural material are nothing short of astounding. Losing a loved one is one of the hardest events that must be endured. When we lose someone that was truly special in our lives, we want to assure that their final remembrance is as long lasting as it is elegant. 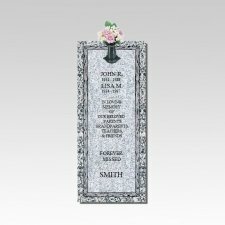 A beautiful full ledger grave marker can create a truly remarkable memorial that celebrates the life of a loved one, and shares their legacy with many future generations to come. 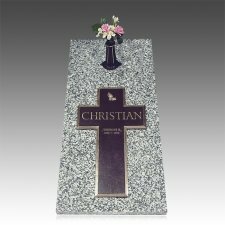 Full ledger markers are designed to cover the entire length of the plot, and create distinctive and unforgettable remembrances. 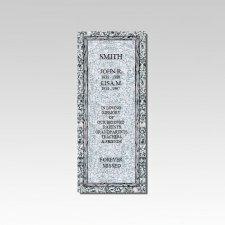 This style of monument can even be adorned with a full-length bronze plaque, which, when placed over the granite, creates an elegantly classic appearance. Cemetery benches are ideal for families that visit the plot often, and can also be personalized with a family or individual name, as well as image etchings, depending on the style of the bench. Cemetery benches create a harmonious and inviting atmosphere, and can be placed right beside the grave site monument; when visiting your loved one take a rest on a granite bench in a peaceful setting.